Manufactured homes, aka mobile homes, get a bad rep. They’re ugly, they’re often found in clusters (magnifying their featureless architecture), and they’re strongly associated with poverty (which hurts the occupants as the homes don’t appreciate like other housing stock). 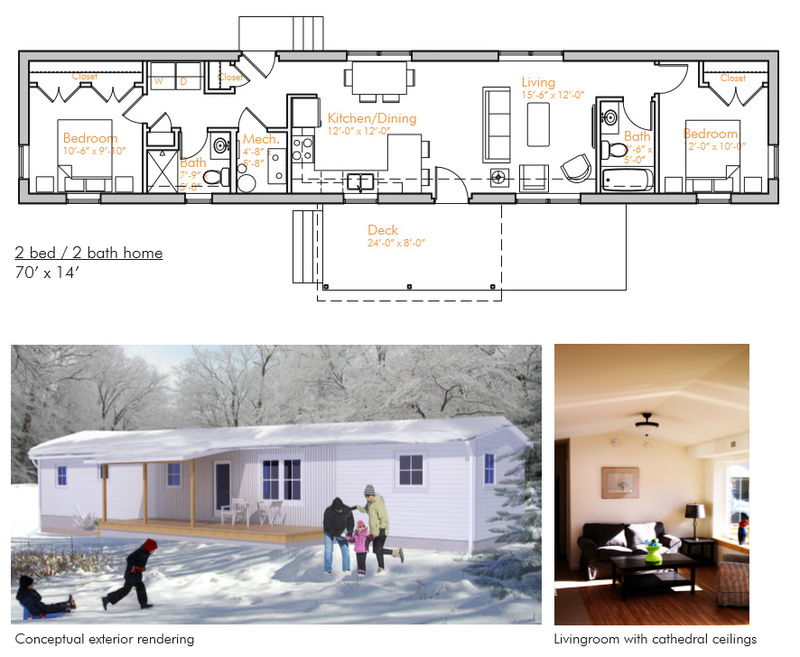 VerMod, a Vermont-based builder of manufactured homes, wants to change that. VerMod homes are built to withstand harsh New England winters at low cost to the owners. Insulation rated R-40 or better – in the walls, the ceiling, and (critically) the floor – along with triple-glazed windows and air-source heat pumps minimize the energy needed to heat the home. Roof overhangs are omitted from many towable homes because they eat into the roadway width, but their presence here prevents snowmelt from penetrating the walls and reduces maintenance costs. And the places look OK, too – utilitarian, for sure, but the covered porch and varied finishes are an improvement over most manufactured homes I’ve seen. Sample floor plan and rendering of one VerMod model. But wait, you’re saying. Doesn’t this stuff cost money? Well, yes… VerMod homes have a higher sticker price than minimal manufactured homes. 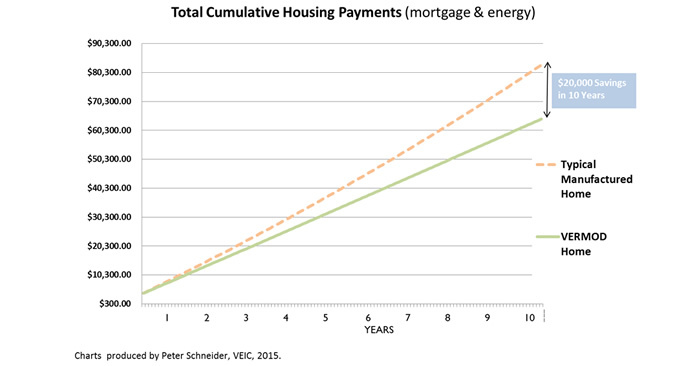 But a mortgage spreads this expense over many years, where it gets balanced out by reduced upkeep bills. In fact, combining purchase and energy costs, VerMod claims an owner can expect to save $20,000 over ten years compared to a person who buys some other manufactured home. And the longer you live in one, the more money you keep in your pocket, just like any other well-built house. The goal is to make these homes a sound investment, one that will attract banks (making the aforementioned mortgage readily available) and perhaps even increase in value over time. A house that helps its occupants escape poverty… now that’s progress.